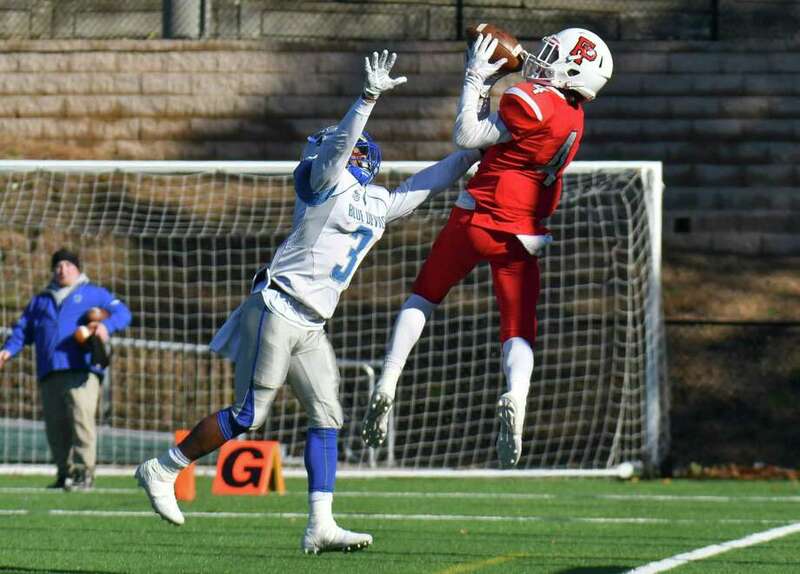 Prep receiver Finn Duran goes high to make a catch last season. Expect a lot more of the same this season. FAIRFIELD - Keith Hellstern has been with the Fairfield Prep football program for almost a decade, including the last three seasons as the Jesuits’ head coach. So, when he says that the skill position talent that he has on his roster heading into the 2018 season is the best he’s ever seen at Prep in those nine years, you’d best believe it. Senior Doug Harrison, who rushed for 1,018 yards in seven starts as a sophomore and added another 337 in two games as a junior before having ACL surgery, is back for his senior campaign and is close to 100 percent. Right beside him will be Connor Boyle, who had 394 yards rushing last season as Harrison’s replacement. Out on the wings will be more of that depth that Hellstern was alluding to, including senior receivers Finn Duran, Owen Cirilli, Peter Cavanaugh and tight end Henry Houghton. And if junior quarterback J.P. Iaropoli can get the ball to his receivers and the offensive line and make holes for Harrison and Boyle, the Jesuits are going to run … and pass … and run … and pass … and run … and pass. Last season, despite losing Harrison in Week 2 and also losing quarterback Will Lucas for several games due to injury, Prep managed to finish 8-2 and make the Class LL playoffs, losing to Greenwich. This season, the mantle of leadership falls to Iaropoli, who got his feet wet last season as a sophomore when Lucas went down. He threw for 300 yards in four games, not exactly eye-opening but enough to give him a decent taste of what’s coming this season. “I’m pretty pumped, pretty pumped for the season, I think we’re going to have a pretty good year. First and foremost, many of those plays involve getting the ball into Harrison’s hands and letting him do his thing. Twice a week throughout the spring and summer, Iaropoli and his receivers got together and went through many of the passing plays that the Jesuits expect to run this season. Protecting Iaropoli will be returning offensive linemen Campbell Halloran (6-2, 240), Will Healy (6-3, 230), Peter Scopelliti (5-10, 245) and Dennis Hampton (6-0, 235). With three home games - Notre Dame-West Haven (Sept. 7), Norwich Free Academy (Sept. 14) and Shelton (Sept. 21) at the start of the season - it’s imperative that Prep gets out of the gates in a positive way and gets the momentum going toward a return to the CIAC playoffs.